I was trying to think about what to post about today. A recipe. A review of a restaurant or coffee shop. A playlist of some favorite music. It would be easy and expected for me to choose one of these topics. After all, Smak is a food and lifestyle website. But then I stepped back and realized that I am now 28. I've been give 28 phenomenal years. Blessed with incredible family and friends. Lucky to have found a job that I love. A workout I am passionate about. So instead of picking a subject matter that is safe, or expected of me, I decided to get outside my comfort zone. Push myself to a point where there is a hint of fear, but the kind of fear that forces you to grow and challenge yourself. Today on Smak I am not sharing my favorite recipe or my new favorite coffee shop. Today I am sharing with you my learnings from the last year and my hopes and dreams for my 28th year. tommy turns 28. || soul reflection. my one word for the next year is: confidence! i want 28 to feel: FULFILLING. i want to try things that i've always wanted to. i want to make time for my passions and hobbies. i want to surround myself with those i care about. my major learnings/areas of growth for 28: getting out of my own head. allowing myself to be confident in what i've gone through that makes me who i am. learn to not be afraid of failure. do things because i love them, not because of what i can get out of them. if _______ were to happen by 29, my heart would explode! SELF-CARE. it's not something that i am always good at. and i am learning that self-care is vital, for mind, body and soul. i've been working out on a regular basis - i want to work towards stretching more regularly and allowing myself proper rest. i want to eat healthy and reward in moderation. i am a writer and i want to work on my craft. writing on a daily basis. 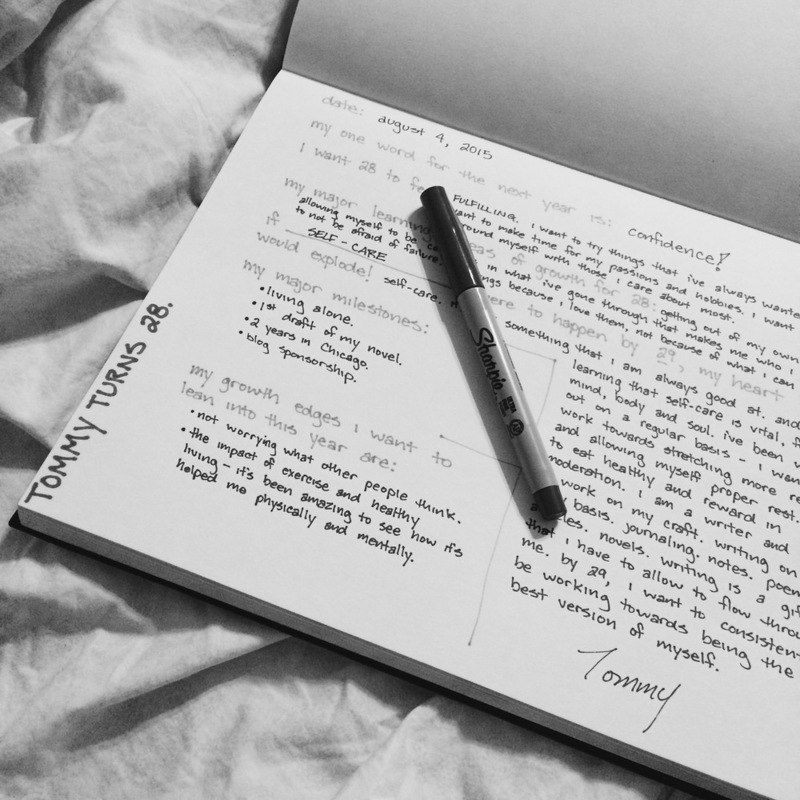 journaling. notes. poems. articles. novels. writing is a gift that i have to allow to flow through me. by 29, i want to consistently be working towards being the best version of myself. 1st draft of my novel. not worrying what other people think. the impact of exercise - it's been amazing to see how it's helped me physically and mentally.